There are 128 active merit badges that Scouts can earn. Through the Merit Badge (MB) program, Scouts have a great opportunity to PERSONALIZE their Scouting experience. The pursuit of merit badges allows Scouts to focus on areas in which he may be more naturally interested (art, sports, academics, sciences, outdoors, etc) and/or can choose from other merit badge areas that expose him to something "new" and/or activities he may never have the chance to do if not for being involved in the Scouting program (like rifle shooting, aviation, or small boat sailing). By BSA design, Scouts work on merit badges "on their own" away from the regular weekly meetings. This enables scouts to work at their own pace and gets them used to interacting with adults who are not their parents (part of his natural growth). As stated above, it also assures that a Scout works on things that interest HIM. There are 21 required badges to earn Eagle. There are 12 "Eagle required" badges (silver bands) which present him with a wide array of knowledge and the remaining 9 or more (green bands) allow him to choose badges that interest him. In Troop 51, we strive to make ADVANCEMENT OPPORTUNITIES plentiful enough that a motivated Scout is empowered to advance steadily towards Eagle (or just work on a lot of stuff that interests him!). The way our program is structured, every monthly camping trip is geared towards AT LEAST 1 Merit Badge. The weekly agenda usually does NOT afford us enough time to complete all the badge requirements, so it is ultimately up to each scout to decide if the "monthly badge" is one he wishes to pursue to completion or not. Note that merit badge work must be done EXACTLY as stated in the Merit Badge booklets. "Explain" means to explain. "Demonstrate" means to actually demonstrate (not just discuss). "Do for 90 days" means to do for 90 days. Merit badge requirements can not be modified by either the MBC or Scoutmaster. 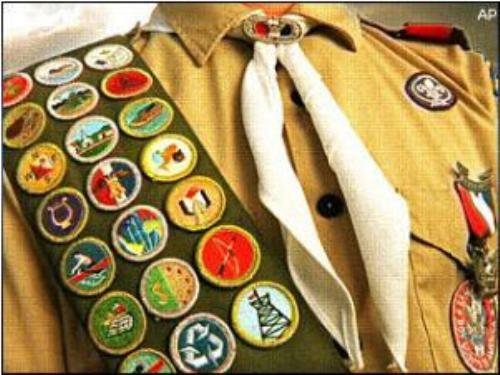 The day a boy signs his BSA application, he is eligible to start working on Merit Badges. There is no BSA age restriction on any of the badges. 1. Scout chooses a badge (or badges) that he'd like to work on (alone or with other Scouts). 2 He informs the Scoutmaster of his intention to work on a badge, and is issued a "blue card" and given the contact information for a registered Merit Badge Councilor (MBC). A MBC can be ANY registered MBC in any Council. He is not obligated to work with councilors in his home unit or Council. Judgment as to whether a Scout successfully completed the badge requirements rests with the MBC. Blue Cards are used to track completion of the individual requirements for each badge. 3. The Scout(s) contacts the MBC and make arrangements to meet as often as necessary to complete the badge requirements (following Youth Protection guidelines at all times). Prior to the first meeting, the Scout should obtain a Merit Badge booklet (Scout Shop or Troop Library) so he is prepared to work on the badge. At the first meeting with the MBC, he should present the blue card which the councilor keeps so that he can update completion dates and keep track of the Scout's progress. 6. The Scout will be given 1 segment of his blue card which he must keep so that it can be produced when applying for his Eagle Rank. The Troop should also retain a segment for their records as will the MBC for his records. 7. A scout CAN change to a different MBC at any time with the Scoutmaster's approval, so long as the MBC is registered for that badge. This is quite common, especially when returning from Summer Camp where future meetings with a camp-provided MBC is highly unlikely. If a Scout wishes to work with a different counselor, he should talk with the Scoutmaster for guidance.